I arrived a bit early again at the Sivananda Ashram in Rishikesh to take more photographs. At 10am sharp I was in Swami Vimalananda’s office: “Hari Om!”. What a loving and natural being he is! 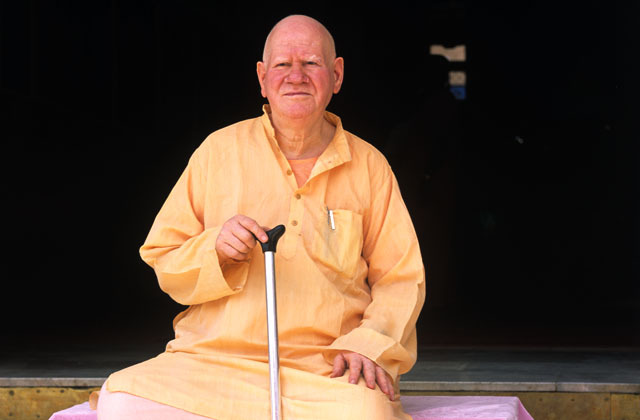 The head of about 160 swamis of the Divine Life Society has spent 60 years in the ashram. He told me about Swami Sivananda’s life and why the Divine Life Society doesn’t go international – to not compete with Swami Sivananda’s disciples who have already set up ashrams around the world. After a cup of chai, I was asked to come back and meet him again at the samadhi at 11.50am for a photo session. This gave me enough time to find a good spot and get the permission to shoot the asana/pranayama class tomorrow morning. The shooting with Swamiji was very relaxed – it’s been such a great pleasure again!